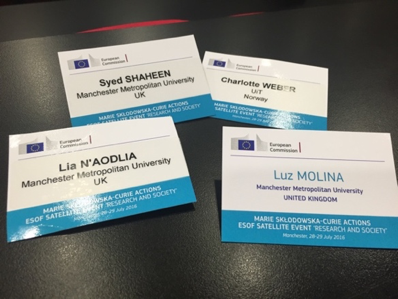 On 28-29 July 2016, Charlotte Weber, Luz Molina, Lia ní Aodha and Shaheen Syed attended the Marie Skłodowska-Curie Actions (MSCA) conference at EuroScience Forum 2016. The two-day satellite conference was held at Manchester University coinciding with ESOF 2016. The conference discussed issues related to society, public engagement, ethics, open access publication, gender dimension, H2020 grant writing and much more. Besides the presentations, there were a number of discussion rounds in which presenters talked about current issues and answered questions raised by the audience. 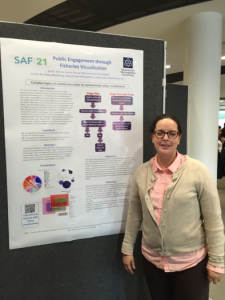 Our researcher Luz Molina presented a poster on public engagement through fisheries visualization. She presented a framework on how complex topics in science are easier to communicate using visualizations. The conference ended with a closing session and networking cocktail. A good way to meet fellow Marie Curie researchers, discuss current research and network for future collaboration.